In order to mark Henry's First Christmas, I wanted to buy him his first festive motif jumper, ready for the billion pictures I want to take. As with everything it started innocently enough, a reindeer romper here, a pompom embellished snowman there, when suddenly I had 4 pieces of magical knitwear. In all honesty I would have quite a few more, however they are selling like hot milk. Its official. Little Monkey has joined the SAS and adopted a commando type crawl for getting around. 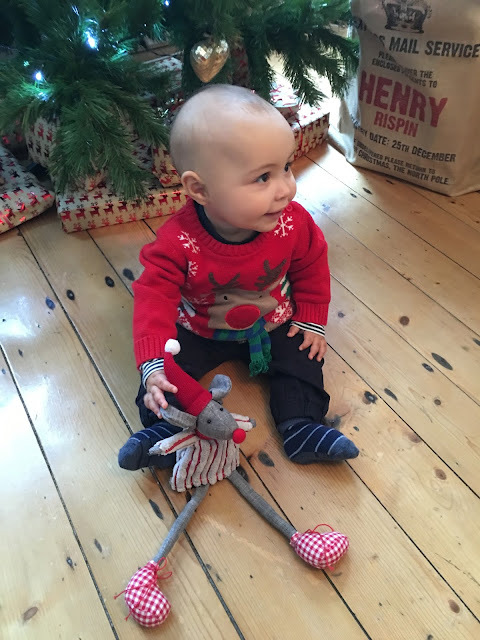 & what better way to try out his new moves, then with this reindeer supersoft and snugly romper. The berry red and biscuit beige print comes complete with a miniature pom pom Rudolph nose. But the best bit is the button fastenings, this is a lovely luxury touch to a value romper. This jumper has Christmas all sewn up in a festive knitted extravaganza (my new favourite word). 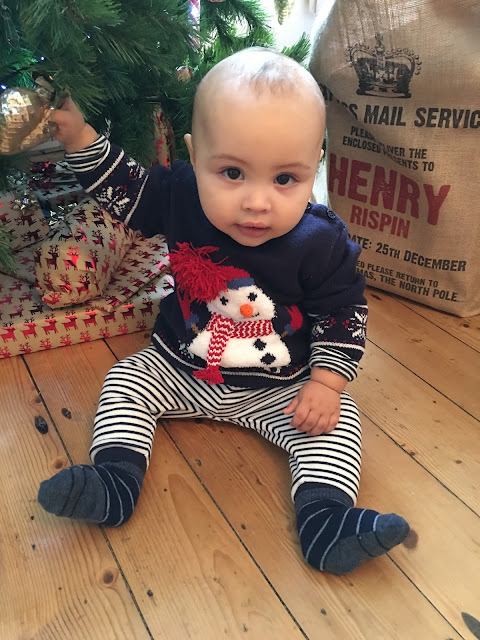 We have Father Christmas, a snowman, a christmas tree, Rudolph and hey, even a miniature Christmas jumper all embossed on this gorgeous little jumper. I've loved Next this autumn winter and this little knit didn't disappoint. Rudolph the red nose reindeer, had a very shiny nose...In fact if he went to Tesco, he would have a flashing nose. How amazing is this? I'm loving red this season and its become the feature colour for our decorations. So loving this cranberry number. This jumper comes with an embossed reindeer with his own flashing nose once pressed and a little scarf to keep him warm. "Snow is falling, all around you"....Matalan this winter has been my go to store for chunky knits. & this Snowman knitted jumper didn't disappoint. Proving everything goes with stripes, this jumper feels very nautical and I love it. The best part, the giant pom pom hat that Henry loves to try and pull off. 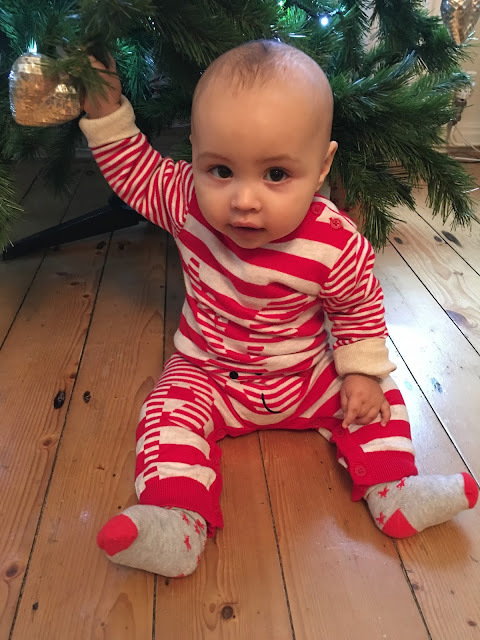 Now Little Monkey is all set for National Christmas Jumper Day on the 18th December, well everyday of December really to get my 6-9 months money worth.